Our professionals have years of experience providing attic cleaning services to our local customers. We always strive to give you the best service possible, and take your specific situation and needs into account when advising on a course of action. We get into all the corners of your attic space. A clean attic is a necessity for a comfortable, optimal house. You may not use your attic especially often, but when you do, you don’t want to have to wade through knee-high dust. Let our experts handle everything related to keeping your attic clean for you. If the worst happens and rodents move into your attic, we are here to help. We provide complete decontamination, cleaning and restoring your attic in order for you to be able to use it again. Don’t put off having your attic decontaminated - the problem will only get worse. We identify health risks and conduct a deep clean, and round off the project with restoring your attic. However, avoiding rodents in the first place is worth investing in. Our experts can rodent proof your attic, ensuring that the unwelcome visitors are kept out. We can also provide this service in conjunction with other tasks, such as decontamination. Does your insulation need to be removed? 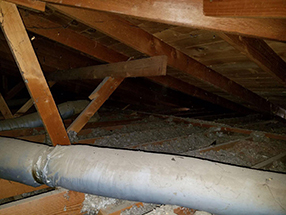 We have extensive experience in handling attic insulation, including removal. Many reasons may be behind having your insulation removed - perhaps you’re planning a refurbishment of your house, or your attic needs an upgrade. Regardless of the reason, leave insulation removal to us. Our attic cleaning services are extensive and comprehensive. Your home deserves to be maintained to the highest standard. Contact Air Duct Cleaning Woodland Hills for the best services around, and our experts will work with you to assess your situation and advise on the best course of action.